The Caucasus region was meant to be a stop on my way to Mongolia. But, I stayed. Fell in love with Georgia. Came back, stayed longer. Fell in love with Armenia. Over the past three years I’ve been leaving – coming back, spending months at a time here. It was the perfect area to travel with family. Finally, we were meant to continue to Mongolia this year. We didn’t. Instead I’m heading back to Europe. Leaving the Landrover, which I’ve so often called home through these adventures. And I’m heading off on a totally different journey. One thing I’ve learnt with all the travels – plans are more hypothetical than concrete. My plan looked like this; warm months – travel towards Mongolia. Cold months – leave the car and travel around South America in the other car. But it turns out that there are very few places where you can leave a foreign car for extended periods of time. And then there are mechanical issues. Parking a car for months at a time equals problems. A hose needs replacing. Something gets blocked, wears out. Surprises… of the bad type. It all ends up being more pain than pleasure. So, I’m leaving the Landrover for at least a couple of years. And, I won’t return to it until I’m done with South America. That’s the new, tentative plan. Seeing that plans rarely work out, I’m not entirely sure if I will ever come back. I’m already getting a little nostalgic. The area has become dear to me and it’s left an imprint on the lives of my wife and daughter too. Georgia and Armenia have very special places in our hearts. Anyway, before I get too sentimental here’s an overview of my time here in photos. No amazing natural beauty would be enough to pull me back to a region again and again if I didn’t love the people. Both the Georgians and the Armenians were ridiculously hospitable. When they’d see little Mia – my daughter the hospitality poured out even more. I don’t even remember all the times that someone offered me something or offered Mia something. An apple here. A mandarin there. When we stayed a couple of days with shepherds in the mountains in Armenia, every family came to give Mia a little gift. It’s easy to get spoilt by the warmth of the people in this region. And it does go back to the old cliché – most of them don’t have much, but they gladly share whatever they do have without expecting anything in return. I found the people to be pretty jovial too. Their lives aren’t easy, but there weren’t many times when a person I’d be talking to wouldn’t crack a joke and share a laugh with me. I initially noticed the hospitality and the love of kids thing in one of the first places I stopped at – Chiatura. I chatted to this cable car operator for just a few minutes. Yet, as soon as he found out I have a daughter, he brought out a sandwich and candies to gift Mia. This would be a common thing everywhere. I clearly remember the moment with these two men. They were selling fishing equipment at the flea market and I photographed them chatting. They noticed and turned to me. I asked if they could just continue chatting and not mind me. They did. I made another frame and said thank you. “May God give you good health!” Was the reply I got. This photo is the result of another example of Georgian hospitality. In Georgia and Armenia guesthouse owners and Airbnb hosts don’t feel like their job ends in providing a good service. They want to help you however they can. Bring you wine or invite you to eat with them. 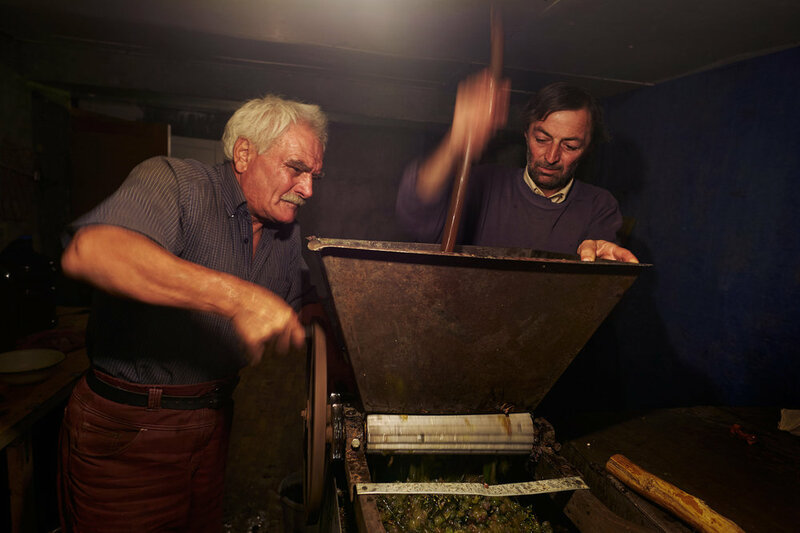 In this case, one guesthouse owner in Signakhi, Georgia said to me one day “We’re making wine and having a little get-together. I’d love for you to come." Who am I to say no? Shamhal and his wife Elvan are corn farmers who live in South Georgia, but they’re ethnic Azeris. Shamhal is 85, still works on the land and clearly remembers back to the times of WWII. “Times were tough then, now life’s easy. Just live, enjoy.” Shamhal told me. Those corn cobs he’s holding were my present. Turned out the Armenians are just as welcoming as the Georgians. Sometimes it felt like people wanted any excuse to put their hospitality on display. Above is Ashot, he sells smoked fish by the road near lake Sevan. We chatted for a while. I asked him about his life. Told him about mine. He was fascinated by my Landrover and the fact that I started my drive all the way from Portugal (the car was parked there on a friend’s farm). Before I left he gave me some of his smoked fish. When I said “No thanks.” He insisted. That’s just how people are here. Marina saw us walking around her village in the mountains of Armenia. She quickly invited us for a coffee. A long conversation ensued. More coffee. Chocolates for Mia. Cookies for us. Not having a language barrier was really wonderful. Most folks over 35 in Georgia speak at least some Russian and in Armenia they still learn Russian in school. 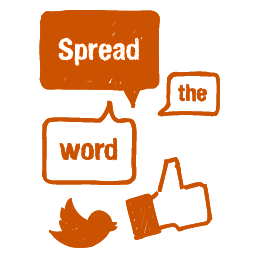 It’s amazing how much you can learn in minutes if you can communicate directly to a person. It could be simple, small things. Like that the man above was named Martin because he was born in March. That he used to be a driver of a 4X4 truck similar to my Landrover during the Soviet times, and now herded sheep for 8 months of the year. Even quick encounters become deeper and more meaningful when you can get an insight into another person’s world. And this was one of the really wonderful things about interacting with the people here. I almost forgot about this after traveling for years in South East Asia and Africa, where I needed translators most of the time. The people I ended interacting with most often were shepherds. Probably because I’d come across them or they’d come across me when I’d park somewhere for the night. This is Zakar, a Yezidi man who lives in a village less than 100km from Yerevan. 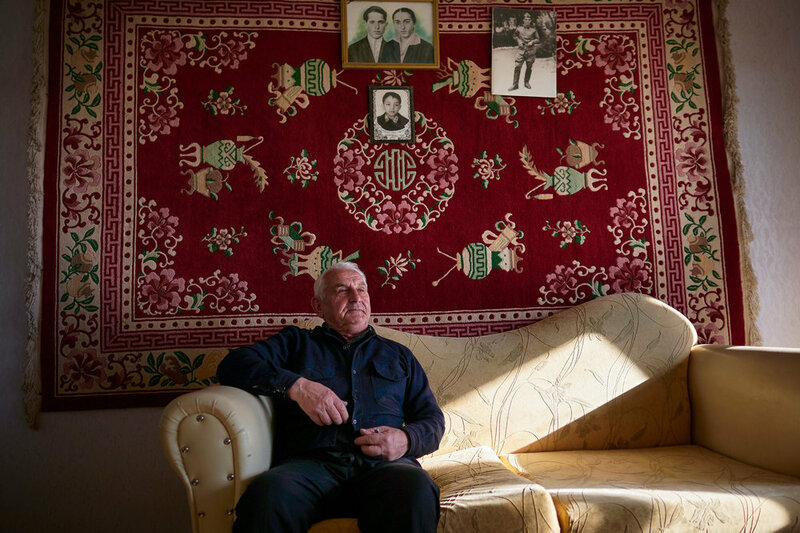 He was one of the rare folks in Armenia who spoke very little Russian. Even so, we chatted and… drank. I’ve come to the conclusion that every shepherd in Georgia and Armenia immediately sees any man as a drinking buddy. Thankfully Zakar ran out of Vodka very soon. There’s no escape when you’re spending a night in the same place as a shepherd. Georgia and Armenia are Beautiful! I’m not sure if there’s a country as small and as diverse geographically as Georgia. Snow-capped mountain peaks, mountain lakes, dense pine forests, beaches, swamplands, there are even dry desert-like areas. It’s just incredible how much geographical variety there is in Georgia. It’s something that my wife and I never stopped being amazed about. Classic scenery from the Georgian caucasus - greenery, flowers and snow-capped peaks towering above it all. A view of Mount Shkhara from Ushguli. More on Ushguli a bit later on in this post. Having an off-road vehicle equipped with a bed (and a roof-tent) is wonderful for places like these. You can spend the night amidst all that beauty and wake up to it too. This is the Koruldi Lakes area – one of my best camping spots ever. Moments before I got to that camping spot near the lakes I had to drive up this road. I didn’t realise how steep the drop was until I flew the drone. In the North coast of Georgia there’s a part where swamplands join the sea via a river. The area might not look like much from the ground, but with a drone - it’s spectacular. Especially when there’s a bit of morning fog over the swamp. Seagulls flying over a tiny island in the middle of Tabatskuri lake in South Georgia. There are crayfish in this lake too. At almost 2,000 metres above-sea-level, the water’s chilly, but I dove a few times and caught some. Nothing like your daughter telling you how much she loves to eat crayfish to motivate you. 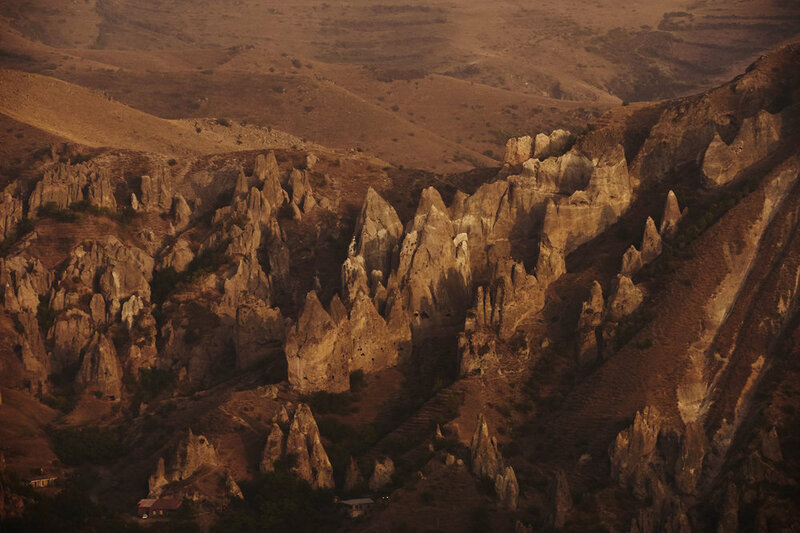 Armenia’s not as geographically diverse and its' beauty is more subtle, or sometimes it’s just plain otherworldly, like the above photo from Goris. There’s an extinct volcanic crater around the middle of Armenia too. I stumbled upon it on Google Maps and decided to visit it out of curiosity. Turned out there were shepherds herding their animals below it too. More on them later. Places like this aren’t even advertised on any tourist itinerary, but you drive past and you stop, because you can’t help but admire them. There are still plenty of mountains and greenery in Armenia. There just aren’t as many forests. Most of the vegetation in Armenia’s mountains is grass. Until you get to the Dilijan area and North Armenia, where you have pine forests. There are at least a couple of well known canyons in Armenia. This is the Debed Canyon in the North of the country. Exploring the area leads you to a few ancient churches and monasteries too. One of the favourite natural spots for many Armenians is Lake Sevan. 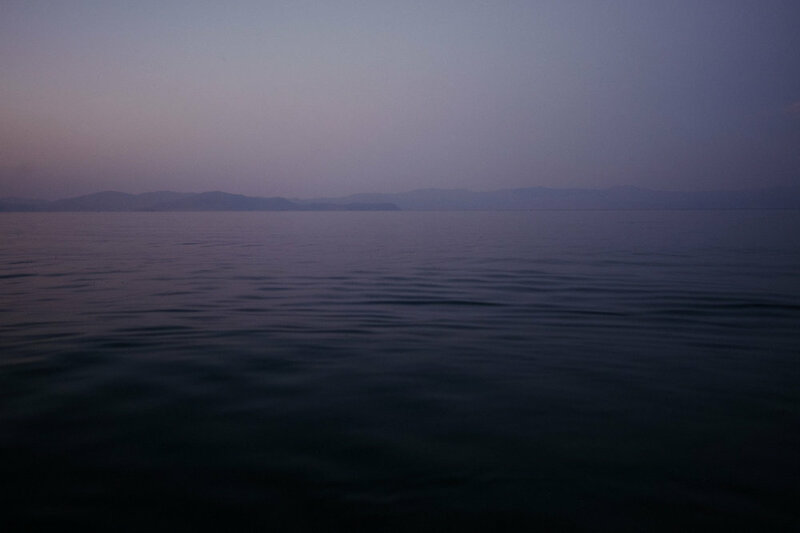 Without any sea coastline, Sevan is the main body of water that most of the population sees during the hot summer months. Almost every Armenian has holiday memories by Lake Sevan. And now so do we. This year was the second time that we parked the Landy and spent a few days right by the lake. In fact, this year it was a whole week. No one around. Just a few cows and stray dogs who befriended us. Great times. Tbilisi is a special, special city. The heart of the capital of Georgia is in the old town and that’s where we spent most of time when we were in Tbilisi. I don’t have any photos from Yerevan somehow. It’s not that I didn’t love Yerevan, in fact I thought it was more enjoyable than Tbilisi, but definitely not as photogenic. One of the most iconic places in Tbilisi is the flea market by the dry bridge. Here people sell everything from old cameras, to porcelain, to Soviet memorabilia. I found the memorabilia part particularly fascinating, and it reminded me of my childhood in the USSR. One thing that really stands out to me about Tbilisi is the afternoon light during summer and early autumn. It floods the streets and the little lanes of the old town, and it lights up the tree leaves a brilliant yellow and green. You walk around and you see this interplay of shadow, light and those bright leaves. Half of the old town in Tbilisi appears as if it’s on its’ last legs, like everything is about to fall. Renovation is taking place in parts of the city, but there’s something so poetic in all the non-renovated stuff. Maybe I’m just saying that because I don’t live in Tbilisi and don’t have to deal with all the problems of this abandonment, but as for me, even these old mailboxes on a crumbling wall look so full of character. Fruits, vegetables, street signs, the light. The streets of Tbilisi are very colourful. I imagine that people coming from places like Minsk back in the USSR days would be quite struck by it all. In fact they still are. 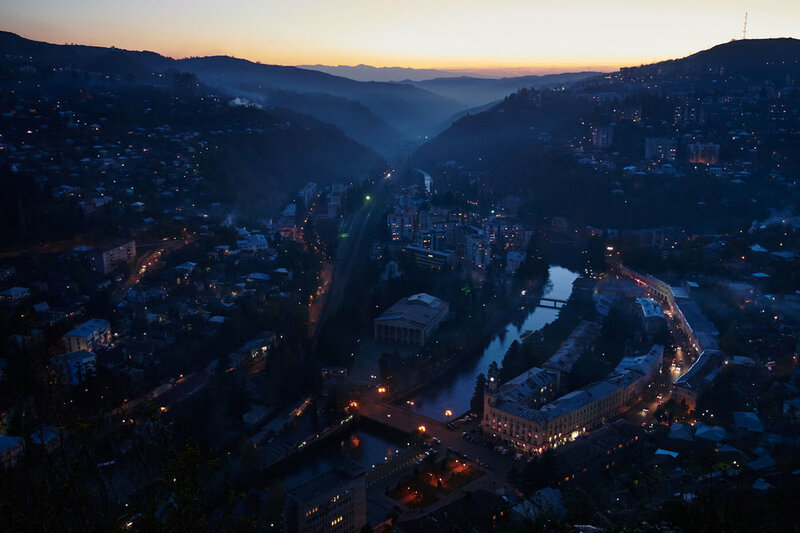 I met a few people from Belarus and Russia who came to Tbilisi, fell in love with it and decided to stay. Sergei sells cigarettes on the corner of one of the main roads. I stayed in an apartment next to this road and often noticed Sergei with a cat. One time I finally decided to make a photo. It turned out that Sergei’s house was just meters away, the cat was his and would come to visit him. There are countless little moments like this in Tbilisi. So many characters. So many of them are very open and willing to chat with a Russian-speaking visitor, particularly the older ones. I suppose that for those older folks speaking Russian is a reminder of the Soviet days. Most of the older generation, or at least the ones who I spoke to remembered those days with great nostalgia. Above is a scene from Tbilisoba – a day when the name of the city is honoured. On this day there are cultural activities all over Tbilisi, performances, concerts. What stood out most to me though, was the cloud of smoke from all the shashliks which were cooked all over the city. For a region so small it’s unbelievable how many beautiful, fascinating, mysterious places there are in Georgia and Armenia. Here are some of the places and encounters that particularly stood out. I drove into a forest to find some peace and quiet one day. I found a spot with a view of the mountains. I was chillin, thinking no one would disturb my peace in this remote place. Then, out of nowhere appeared a man. He was a shepherd and his hut was just a hundred meters up the mountain road. His name was Tamaz. He was drunk, but incredibly friendly. He insisted that I come to his hut to have a drink. He even grabbed me by the arm. I resisted, telling him I’d come by tomorrow, and I did to his surprise. Tamaz was still drunk in the morning, or drunk again, but lucid enough to tell me about himself over a cup of tea. He’d been a shepherd for 30 years. Served his time in the army in a battalion in Siberia, where they sent criminals. I didn’t ask how he got there. Tamaz lighting his stove to cook potatoes. As most Georgians, Tamaz was very much into giving, sharing. He was disappointed that I didn’t drink more chacha (damn that stuff is poison). When I said that I didn’t want any cheese either, Tamaz exclaimed “Oooh, I don’t like this! A guest should eat! Why are you not eating? Not drinking?” So… I couldn’t say no to some boiled potatoes with home-made butter, which was delicious by the way. As well as some home-made jam and tea. I parked my car on a flat bit of land about 50 metres away from Tamaz’s wooden hut. I finally found my quiet place and only had to worry about Tamaz coming over in the evening to invite me for a drink. I found out at a little restaurant atop a mountain pass that in a couple of days a cultural festival coming up. It’d be in a little village a few kilometres away. Up to this point I only heard promises of festivals in Georgia, and none of them materialised, or they turned into disappointment. Of course I wanted to stick around! The Beshumi Cultural Festival did materialise and it was pretty fascinating. I only wish that I came earlier, as the most interesting things were the preparations, like these traditional dancers practicing before their performance. There were horse races! I love that in Georgia there aren’t the regulations that you have in the Western world. I found a spot where I could be right by the hooves of the horses to get the action shot. Much of the population in the Adjarian villages are Muslims, which is surprising in a country as devoted to Christianity for as long as Georgia has been. Nevertheless, it’s a reminder that Georgia is fairly multicultural. In the photo above, the villagers are watching a wrestling match. Wrestling in a big thing in some of the villages in Adjaria. 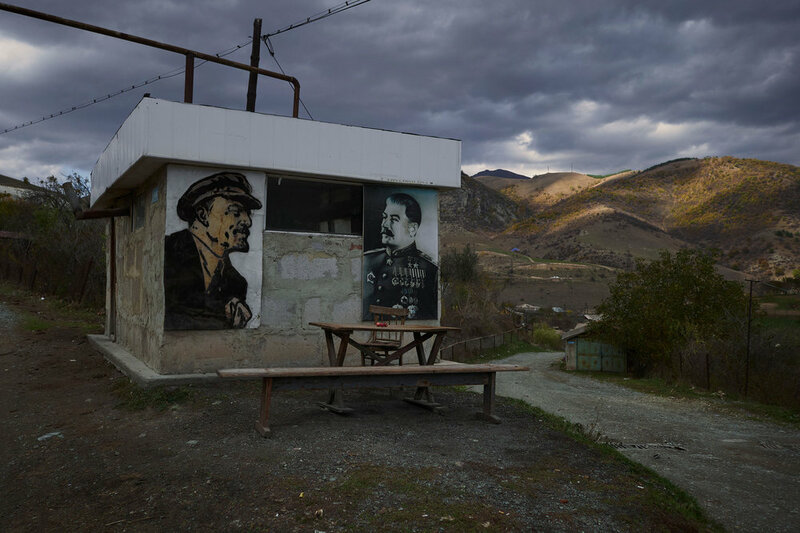 Chiatura is a former prosperous mining town and home to the first cableways in all of the USSR. The cableways used to take the residents from the town centre to their homes in different parts above. Only a few of them are still functioning. And only a couple are used by the general public. Renovation efforts are on the way, or rather they have been on the way for a couple of years already, but as of now there aren’t any new public functioning cableways. This is what the cable cars looks like. Not very confidence-inspiring, but the man running them assured me that in all the recent years there was only one accident, in the mid 90s, when everything in the former USSR was completely neglected. I did take a few rides in two of them, and well… I’m here to write about it. Passengers chat inside of a cable car that takes them to their homes from the town centre. Chiatura lit up in the evening. While parts of the town normally look pretty neglected. It actually all looks pretty magical and beautiful from above and after dark, when the lights come on. A boy looks over the town of Chiatura though the window of a cable car. At around 2100 metres above sea-level, Ushguli lays claim to being the highest all-year-round inhabited settlement in Europe. While that’s up for debate, Ushguli is a special place. It’s setting is stunning. Ushguli is surrounded by snow-clad mountains in all directions and there are the famous Svan towers too. The towers were used to see warn of enemy attacks and apparently all the clans were at war with each other, hence there are so many towers. While the Caucasian shepherd dogs can be ferocious, the ones in Ushguli are generally pretty docile. There isn’t much work for some of these dogs, but there are many tourists. The dogs figured that they’re much more likely to get fed by newcomers if they act nice, roll around and whine. That’s what this huge male did when he came up to my car. A local woman confirmed that the dogs seek out foreigners in the hopes of getting food. Wandering around the lanes of the crumbling village we bumped into the son of this elderly couple. He invited us in. Chacha, home-made cheese, bread and a portrait session of the parents followed. A young shepherd boy who was helping his mum herd cows. As he made his way towards home, I asked him to stop for a second to make his photo. He did and looked at me with a mixture of curiosity and cautiousness with those piercing blue eyes. I visited Ushguli 3 times, and the weather wasn’t ever great for more than a couple of days. It’s always volatile in this region. Could be sunny in the morning and pouring down by afternoon. The last time we visited was peak season. There were more foreign tourists than the local villagers. The one street of the village was packed with cars, as were the few small restaurants. Ushguli is definitely at a point of transition. I’m a little pessimistic about what kind of transition it will be, but I’m glad that I got to see before it possibly changes beyond recognition. Tusheti is one of the most isolated region of Georgia. It’s connected to the rest of the country via a single, winding mountain road, reputed to be one of the most dangerous in the region. This road isn’t even open most of the year due to snow. 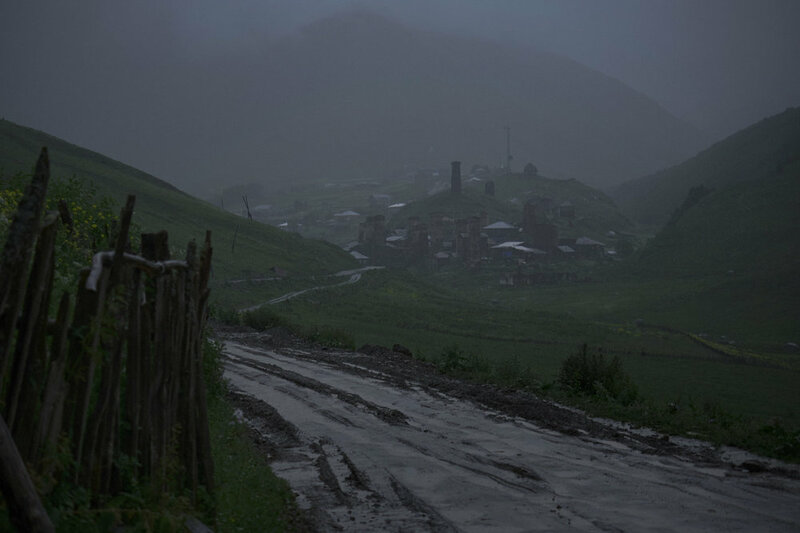 No one lives (ok, maybe there’s a person or two) lives in Tusheti all year now. But many Tushets come back to their ancestral land from all over the world during the summer. The region is also experiencing a boom in tourism, as it’s an absolute natural paradise, especially during the months of scorching heat in the low-lands. Boy rides a horse near the village of Kvalo. There’s a new hotel in the village and it can only be reached by foot or… on a horse. Men waiting for a meal before a celebration in the village of Chesho. Though the villages are uninhabited for most of the year and the residents live all over Georgia and overseas, traditions are still followed, as in the old days. If a man isn’t able to attend due to health problems – he sends his son. If no one from the family attends it’s seen as disrespectful to the rest of the community. This stuff is taken seriously. While I was in Chesho there was a young man from Seattle attending a ceremony in his ancestral village. He wasn’t even born in Georgia, but this is an example of the strength of the bond that the Tushets have to their land and their culture. I camped by this river after being invited for a meal. I remember the villagers being really amused by my drone. They didn’t know what it was. A man I met at the celebration told me when I saw him again that everyone was really puzzled and even a little scared. The view of the towers near the village of Chesho. There are few regions in the world where the architecture punctuates the natural beauty as dramatically as in the villages of Tusheti. I knew nothing about Bakhmaro from any guidebooks or articles. My Aribnb host told me about it, and he gave good advice before, so I went. It was foggy when we arrived in Bakhmaro. A man at the only restaurant in the village told me that the fog was normal. People from all over Georgia came to Bakhmaro for the fog. To breathe in, to absorb the moist air. Here at over 2000 metres altitude, the mountain air mixes with air from the back sea and reputedly has medical properties. No one lives in Bakhmaro during the winter either. Those who come in the warmer months are mostly local tourists in search of that clean, medicinal air. The other folks are the Adjaris from a few villages below. There are great, green pastures in the mountains of Bakhmaro so a few families have basic wooden homes and enclosures for their animals. This is at entrance to the village, which is usually marked by a cross in Georgia (in Christian villages). The spot is popular during evenings, when some people come to chat to each other, while others come to get better phone signal. I wish I got to know more of his story, but he was busy. Someone wants to be blessed here. Another person is asking about a wedding ceremony in his village. Georgians are big on Christianity and priests are very important in their society. 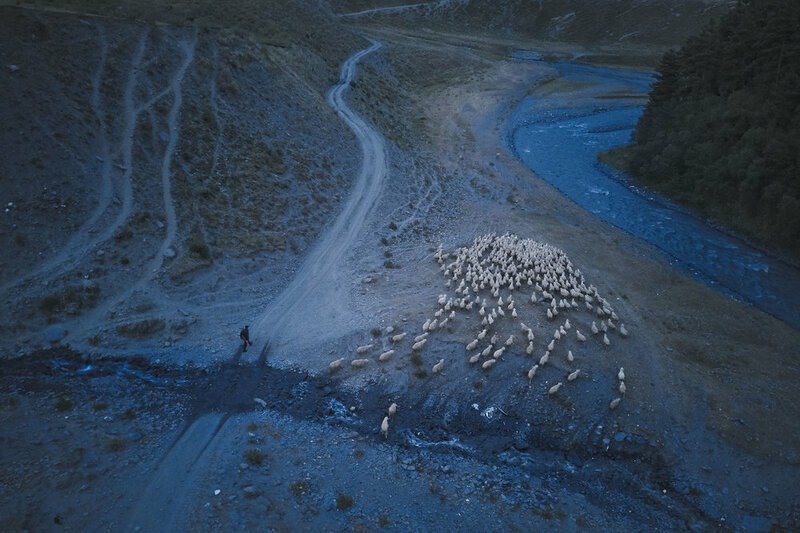 One of my favourite memories from Armenia was the time we spent with the shepherds below an extinct volcanic crater. The one I found on Google Maps and visited out of curiosity. Not only was the sight of Armenian cowboys in such setting very photogenic, they were very welcoming too. Which wasn’t a surprise by this stage. This is Anahi, a wonderful, warm woman who fed us some of the most delicious vegetable soup I’ve tried in my life. She’s got the most cows out of everyone on the mountain. She’s still in good health and able to take on a pretty heavy workload. She milks the cows, herds the calves herself and even has enough time to make cheese and prepare food. Tamara is Anahi's neighbour at the camp. She has far fewer cows. There used to be more, when her husband was around to help. Now he's having health issues and stays in the village. This is the settlement photographed with the drone. It used to be much bigger before, from what Manvel told me. But the old are getting older and the young are leaving. This way of living is disappearing, at least in these parts of Armenia. Perhaps soon the entire area around the crater will look like this. Without any shepherd settlements dotting the landscape. One evening we stayed at a resort/camping ground by Lake Sevan. The reason I chose to stay there was not for the facilities. I heard that every evening just before midnight, fishermen come to this particular beach, after hours on the lake. They sell their catch to the resort owner, who’s also a fisher re-seller. The lake was really calm early on in the evening, but to my surprise, by the time the fishermen came back, it was rough. So rough that one of the larger boats couldn’t be brought ashore without some major struggles. The boats came out of the dark. No light, except for the head-torches and in some cases, a car's headlights. There were different characters amongst these fishermen. The first group that came out was extremely friendly. They greeted a stranger with a camera, appearing from darkness with "Go get a bag. Take some fish!" Some didn’t pay any attention to me. Which was great too, for candid looking photos. Roma (the one smoking) was one of the last fishermen to come to shore. “So, how do the photos turn out in this darkness?" Asked Roma. “Let me take one of you and I’ll show you.” I replied. His friend peaked into the camera, as if the answer to Roma's question would be revealed by looking into the lens. Georgia and Armenia are countries where you can find some of the most beautiful ancient churches and monasteries. Marvels of architecture, and within just a few km, sometimes even visible from those churches stand some of the most ghastly examples of Soviet brutalism. The sight of the church on the Katskhi pillar is almost surreal and it’s less than 15 km from Chiatura, the mining town, now full of abandoned Soviet factories. The monasteries and churches in both countries were built in some of the most beautiful places, with the best views. They were made in such harmony with their surroundings. What followed during the Soviet times? Quite the opposite. This is Khor Virap – one of Armenia’s most famous monasteries. That, in the background is Mount Ararat, the most sacred geographical feature for Armenians. It’s only a few kilometres from the monastery, yet the closed border between Armenia and Turkey means that it cannot be visited directly. I’m not one to seek out architecture to photograph it, but in both Georgia and Armenia, seeing something amazing is inevitable. 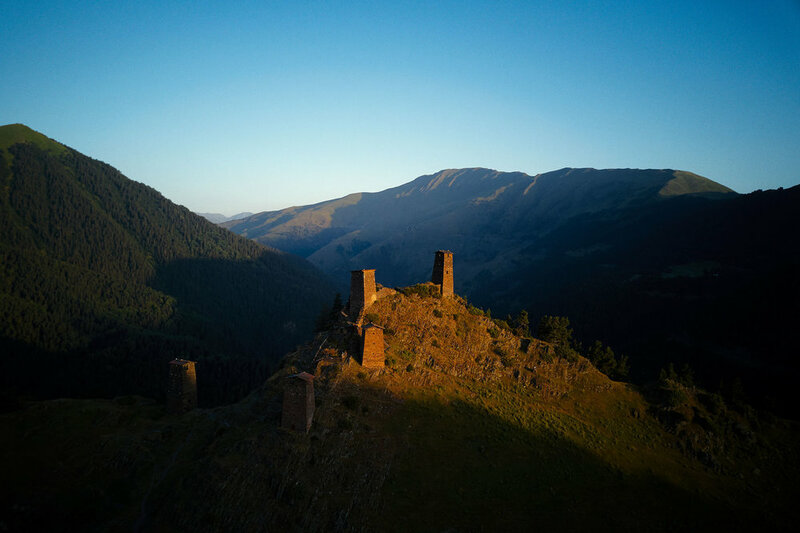 Above are the towers of the old part of Omalo in Tusheti. I was going to stay in Omalo anyway, so I parked the Landrover to have this view in the morning. The thing that soon strikes you in this part of the world is that the cultural heritage is so rich and there’s so much of it everywhere. Perhaps because of that, apart from a few sites you don’t see the crowds. And there aren’t the strict regulations you get in much of Europe either. You can get into many of the sites any time you like, even during the night. Which is exactly what I did with this fortress above Debed Canyon. There’s nothing quite like visiting these sorts of places at night. They become magical. There’s something timeless about a starry night. You feel like you’re transported back into the times when such fortresses were built. Next morning was the beginning of the weekend. I parked and slept in the car right outside of the fortress complex. I was worried that the weekend crowd would wake me up and ask me countless questions (often happens when people see the car). Yet only a couple of families came. For me, this sort of stuff is in direct contrast to the ancient churches, monasteries and fortresses. Communist architectural legacy… You see this stuff all over the former USSR. While the statues of Lenin have been brought down in most places, memorials to the working class (above) and to war heroes have remained. This giant World War II memorial statue stands at the entrance of Chiatura. It promises some sort of grandeur, something amazing upon entering the town. Yet even the residential blocks next to it look to be on their last legs, far from grandeur or any sort. Speaking of Soviet residential blocks – there are many in both Georgia and Armenia. I was born in a Soviet apartment block, a 9-storey one in Minsk, Belarus. Looked as depressing as these ones, except I didn’t even have a mountain view. My windows looked at a local supermarket (Universam). I have very negative memories of the Soviet apartment blocks. The flats were tiny. The ceilings low. Yet outside, the boulevards were wide enough to fit a parade and any government buildings were HUGE. Everything to make the individual feel insignificant. I hate these apartment blocks, but I feel compelled to photograph them. Another type of Soviet architecture I hate, but feel compelled to photograph –the Soviet industrial buildings. The Soviets build factories everywhere, without much regard for nature or human health. Not even mentioning visual harmony with the surroundings. Many of the factories have been closed since the break up of the USSR, leaving plenty of people jobless. But some remain. There are some in Rustavi, a small formerly flourishing industrial town about 25km from Tbilisi. There’s some strange, twisted beauty when you see these factories puffing all that smoke out at sunset. A half-abandoned mine and factory complex in Alaverdi. This is an area of stunning natural beauty, yet, you have this puffing behemoth with a beautiful mountain backdrop. It’s photogenic in, again, some kind of twisted way. A common type of building complex during the Soviet times was the sanatorium or health resorts. Georgia, with its’ incredible natural riches and crisp mountain air had quite a few sanatoriums. Most were around the town of Tskhaltubo. As you probably guessed – most are now abandoned and dilapidated. What’s fascinating about the sanatoriums in Tskhaltubo though, is that a few complexes have become homes to refugees from the Abkhazia war, which took place over 20 years ago! Yes. Quite a few refugee families are still living in the dilapidated sanatoriums. They might not look like much from the outside, but there’s running water, electricity and people have made some of the former hotel rooms pretty cosy. I met one of the residents on my first trip around Georgia. His name was Vakhtang. He spotted me and a friend walking the corridors of his building. I didn’t expect that anyone lived there at that stage. But, Vakhtang invited us to his home, got my friend drunk on wine and chacha and shared many stories. You can read more about him by following the link below. Personally, I’m not a big fan of visiting ancient churches or monasteries for the sake of a cultural and history experience. Definitely not for spiritual experiences either. But, I was drawn to the churches in Armenia. There’s just a really special atmosphere in many of them. You don’t have these elaborate frescoes depicting dramatic scenes of armageddon from the Bible. What you do have are stones with engravings, in many cases over 1000-years-old. And you have the people, who seem to be as genuinely devoted to their faith as the most devout places I’ve been to. These churches and monasteries are like little worlds that don’t seem to belong to the rest of our world. Sunday masses are attended in even some of the more remote churches. This is near the Debed canyon. The mass was finishing when I arrived and I saw a whole lot of people pouring out of the church. 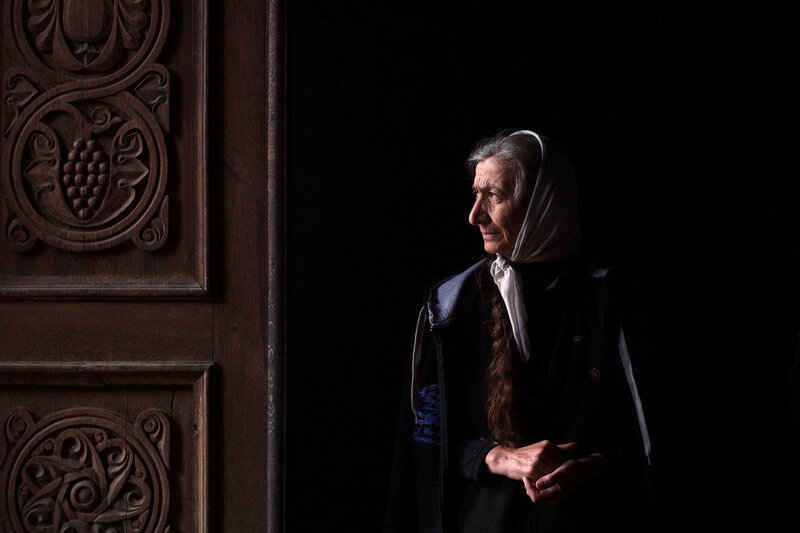 This woman was overlooking that other women present themselves properly in the House of God in Tatev. Anyone with a skirt too short - she’d put a cloth over their legs. Someone without a headscarf - here’s a headscarf to cover yourself. A priest blesses the entire church with incense before Sunday mass. You get some wonderful lighting because of all the windows and the channeling of light through them. A woman being blessed in Geghard monastery complex. There was a whole line of people waiting to get blessed. The priest found the time to bless everyone who wanted it and even to give out some advice. Devotees putting up candles at Geghard monastery complex on Sunday. 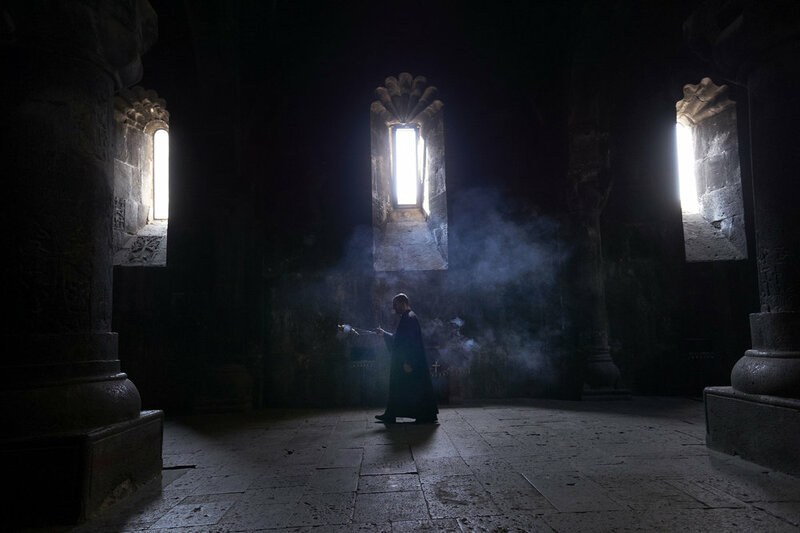 Geghard is probably the most alive of all the monasteries in Armenia, which makes it a fascinating place for people watching and for photography. There aren’t many highways in the region, so the roads, while sometimes jammed with traffic are actually one of the best things about a trip through Georgia and Armenia. Some of the roads go through absolutely stunning scenery. Some take you past things that you don’t really see elsewhere. And a lot of the smaller ones give you a real insight into the lives of the people of the region. Just a regular sight in the mountains of Armenia – a dude with a horse stopping to chat with the driver of an old Volga, in the middle of the road. Oh, and there’s an object atop the car that would probably draw a fine in most of the Western countries. But this is real, raw and wonderful. Part of what makes a road trip through Armenia so fascinating. Sheep and cows momentarily blocked this country road for a couple of old Soviet trucks. This is such a common sight in Armenia and in Georgia. Animals go out in the morning – create a traffic jam. Come back in the evening – create a traffic jam again. One of my favourite roads that goes to Batumi via the Goderdzi pass. Mountains, pines and fir trees all around. It’s common to find people selling produce along the roads in both countries. Depending on the area it could be melons, tomatoes, persimmon, or it could be pickled cucumbers. An ethnic Azeri woman in the South of Georgia selling dry corn cobs. I had a few opportunities to make photos of the road-side sellers, as Tanya always wanted to buy some fresh fruits and vegetables. Around October, when the weather gets colder, you see a mass movement of animals down from the mountains. This happens throughout the Caucasus. You’re most likely to see them when they’re crossing a road or a little distance away from the road. Almost always there’s a cowboy like this Armenian man guiding them. In November it’s cabbage season in North Armenia. People are collecting cabbages from the fields and packing their cars full. I saw this family from the main road, drove off and asked if I could take some photos. They agreed and even invited me for lunch, but, I had to keep going. Even in crappy weather, Georgia provides photogenic opportunities along its’ roads. These are ethnic Azeri shepherds who were heading back to the flatlands from the mountains. They’d been herding their animals in the verdant pastures of South Georgian mountains for months and now it was too cold. A wrong turn in a village by a highway in Armenia and I came across this fantastic bit of weirdness. And that’s the other great thing about driving in the region. There are these strange surprises you won’t see elsewhere. “Go ahead, take a photo, everyone does.” Said one of the villagers. Everyone? Who’s everyone? Who comes here? I only ended up here because I’m lost. And is this bus-stop mural for real, or is it a joke? I’ll probably never know. Another great, weird scene. One of the most innovative uses of old Ladas. I’ve never seen this outside of Armenia. This is a wall above a river. It's reinforced with the metal from the sides of non-functioning Ladas. I saw dead cars like these being used for fences and cattle enclosures everywhere. There are a lot of dead cars just out in the open in Armenia. 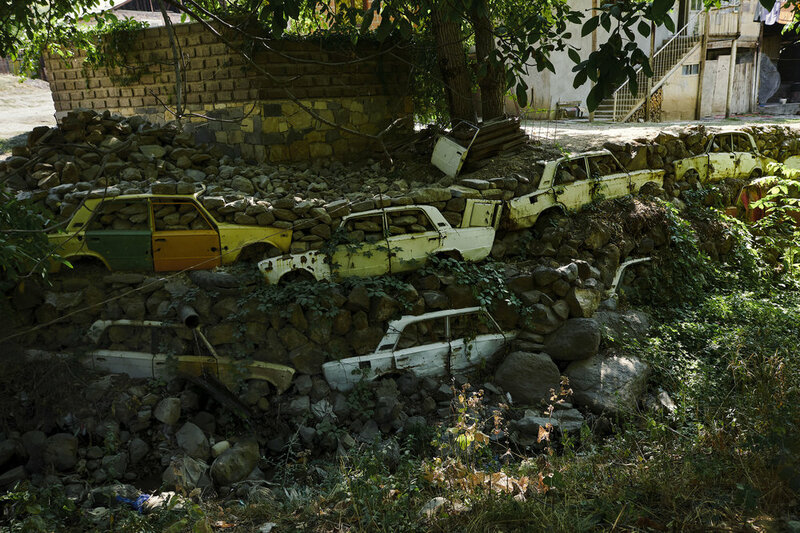 This really felt like a car graveyard along one of the roads not far from Yerevan. Driving towards Yerevan via a mountainous landscape. The whole way was beautiful and then it finally occurred to me to take a photo at dusk with the new Mavic Pro 2 drone. The most special part about this journey to me was that I did most of it with my wife and daughter. It’s wonderful that the region is so hassle-free, so safe. You can stop virtually anywhere and not worry about someone robbing you or hassling you. Traveling with my daughter Mia is one of the best things I’ve done in life. The world is her classroom. When she goes to school and someone talks about ancient history or geography, or whatever else, she’ll probably already have a real-life association with it. Above she’s exploring an ancient Armenian church with her toy mouse. Mia getting a quick lesson about Armenia’s Khachkars in the village of Noratus. Khachkars are ancient tombstones depicting all sorts of tales about the people buried under them. We once stopped by a little river paradise in a lesser known part of Georgia. It was recommended to us by a local villager. A clean place to bathe, the perfect climate and I even had 3G internet signal. What’s not to like? That’s what our house looked like while we spent over a week by the seaside in Georgia. We moved when the weather got bad, kinda nomadic. Mia’s room inside the Landy. Like most kids these days she loves to take away my phone and lock it by getting the pattern wrong too many times. I’d say the only downside of traveling with a kid is that sooo much space is taken up by toys. Thankfully, most of Mia’s toys are soft. So, we just shove em wherever we can, to make the most of the space. Dancing by the fire next to Lake Sevan in the evening. Mia’s favourite music are Bollywood hits. A couple of tracks from the old classic Disco Dancer sends her dancing every time she hears them. It’s like she becomes possessed. Spending nights out in the open can be pretty magical. Mia already knows more star constellations than me. I am fully aware of just how special it is to share this time with my family on these journeys. To see my daughter grow, to be there as she discovers the world – it’s amazing. There are definitely times when I feel stressed that I’m not working on enough projects, that I’m not moving forward photographically, but then I put everything in perspective. I ask myself – When it’s all said and done, am I gonna be happy to leave the world with some amazing photos to remember me by if I don’t even have memories of my daughter as a child? Some people do choose the work, the photos or whatever it may be. But for me, I’m ok with not reaching some sort of creative/photographic immortality if the price is to be able to look back and say - Those were magical times with my little one and the people that mattered. For now I hope that these childhood years earn me some coolness points so that the teenage years won’t be as painful as almost every parent says. I write this blog post from Turkey. I’ve got less than 1000km to get to Sofia, Bulgaria. That’s where I’ll leave the Landrover, with a friend. What a journey it’s been. It’s strange to now look back and to realise that I had only heard of these two countries 3 years ago. And now the whole region feels like a second home. So familiar, so close to us. I can only hope that our trip around South America will be as special as this one.